Early yesterday evening I was sitting on my back steps labeling some freshly seeded soil blocks (6 different Basils in the first batch this year) when I heard an unusual bird call, a long loud whistle. It was familiar to me but I was certain I had never heard it in my neighborhood; it was a rural, wild sound. I live in a commercially landlocked “National Historic District” neighborhood that dates from the mid 1800s. 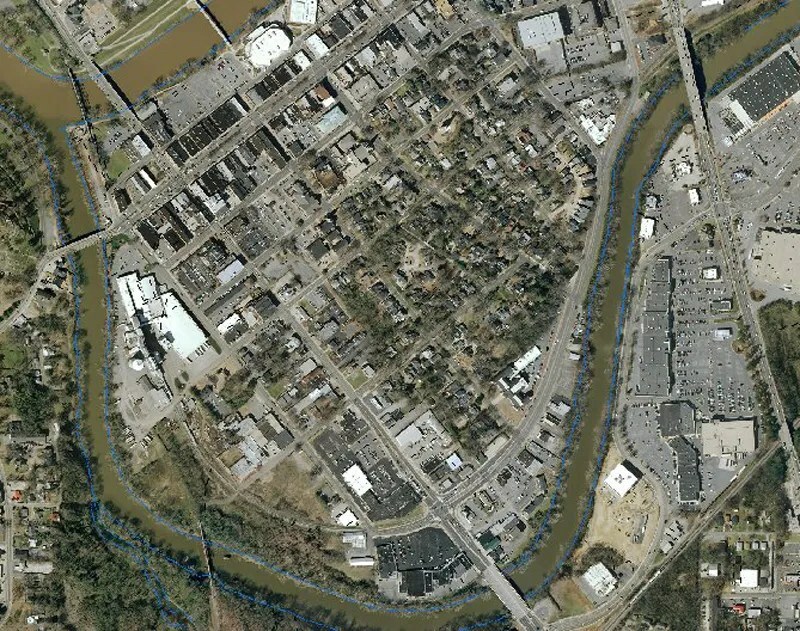 It is downtown in a city of perhaps 35,000 people in a small county that pushes 100,000 total. We are shoulder to shoulder down here, as my “large” downtown lot is only 70′ wide and 240′ deep; line a couple more of these up and you almost have a short landing strip. We are in a peninsular noose formed by the confluence of two rivers; while the rivers are very close to me in pretty much every direction, there isn’t much green space on either side of them. The aerial shot below shows the neighborhood and the surrounding area; I am on the southeastern edge of the heavily treed residential area that shows roughly the boundaries of “the hood”. I finished the basil labeling and started to inspect/water/weed and do a little cleanup per the standing request of Mrs cohutt. I was @ the front steps of Lizzie’s house when out of the corner of my eye I noticed some motion behind the boxwood to my left. I alerted mrs cohutt by text then continued to follow my new friend around the yard as he selectively stopped and consumed a few small seeds here and there (all weed seeds as far as I could tell; he has an open invitation to return). Mrs cohutt joined us for a few minutes; he eventually decided two dumfounded humans watching him forage was making him a little uncomfortable, so he flew over the fence and disappeared into the weedy jungle patch of privet, ivy and January jasmine across the alley. As I am finishing this post over a cup of coffee, I can hear him announcing the pending sunrise from the small thicket that he disappeared into last night. 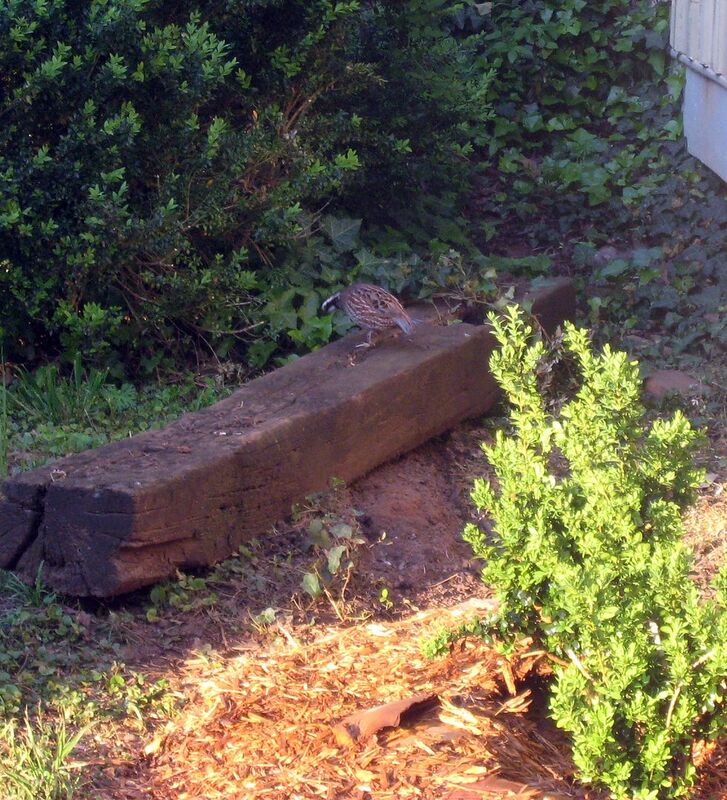 “The Urban Quail”; Will he stay for a while, or is he just passing through? If he stays, will the shrill opponents of backyard poultry demand their idiotic and misinformed new zoning prohibition be expanded to include the often domesticated Bob White quail? I sure enjoyed the writing in this post. “We are in a peninsular noose formed by the confluence of two rivers” – great! Thank you very much. 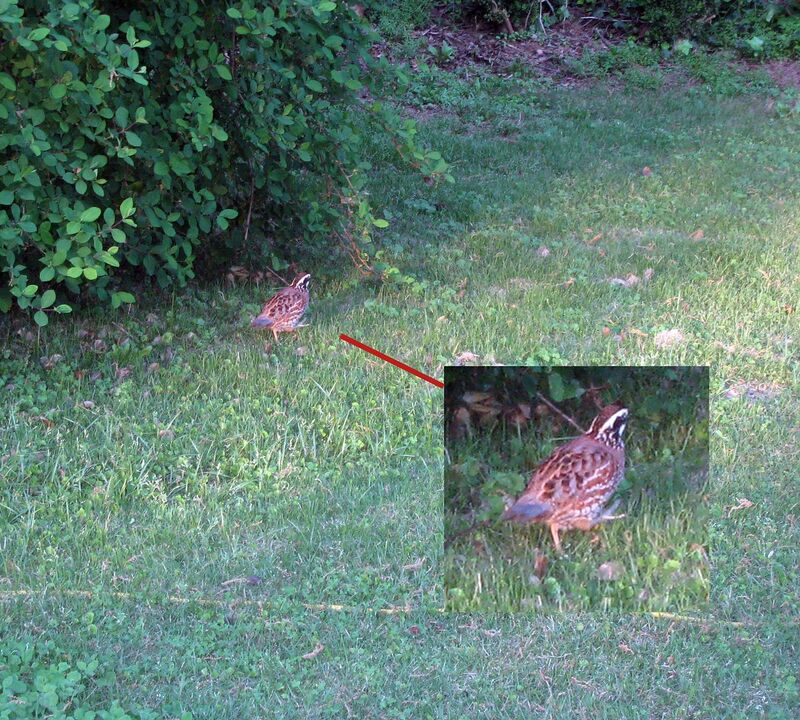 I’ve been waiting 25 years for a quail to appear in my yard so I could use that sentence. I went to google translate and set the translation from “bumpkin” to “hifalutin literary snob-type.” I then typed in the phrase “Us n’s are living in a f….ing floodplain where two dirty cricks come by.” Oddly enough, google translate returned this phrase: “We are in a peninsular noose formed by the confluence of two rivers”. I think we now know that everything Cohutt writes is being rewritten by google translate before publishing. Yeah yeah, refer to your brother in-law’s comment above, he knows genuis when he raeds it for suer.